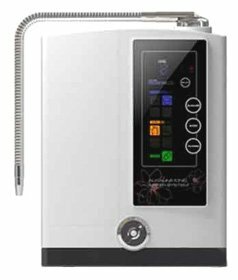 The Jupiter Science Venus Water Ionizer JP107 is a not like your typical water ionizer, as it is equipped with a number of features designed to make it easier and more practical to use. The Jupiter line of products was developed to replace the Microlite, and it uses a lot of new, proprietary technologies that definitely make these water ionizers several notches better than their older counterparts. The JP107 has many features designed specifically to make it an all-purpose and dependable water ionizer. The highlight here is its use of touch screen technology, making it easy for anyone to use. Manufactured in Japan, the Venus’ feature set was designed expressly for the management of acid and alkaline water year after year. Another important feature on the Venus is the manual voltage adjustment for all 24 pH levels, something you don’t usually see in other devices. The Venus also has a biostone filter that can use a .01 or 1 micron filter. A lot of attention has also been placed on the design, as the cold water / faucet line hookup is straightforward, making it easy to install. The Venus JP107 also has a five year warranty, a testament to its quality. But more than that, the ionizer also features Jupiter’s proprietary matting technology for its cell electrodes. This is a very important feature and is what sets it apart from other water ionizers. With a good ionizer, it’s important that the material lets water pass as the ionizing process begins. But if there’s no auto cleaning cycle, hard water deposits will be left and affect the transfer process. That’s where the proprietary design comes in, as it was developed to be highly resistant to these deposits. Because of its design, iron, lime and other minerals are sloughed, leading to superior ionization. Another important feature of the JP107 is its internal structure, which allows for better separation of alkaline water and acid. With the enhanced segregation between acid and water, there’s better ionization, at the same time increasing the chances of isolating any fluoride or chlorine. The combination of improved matting, superior draining and an enhanced inner structure allows the JP107 to run on a single clean cycle of 10 seconds per 20 liters. The JP107 has a lot of excellent features, and these are among the most important for consumers. * There are several pH levels. * The filter is versatile. * The touch screen technology works as well as advertised. * The device does a good job of separating alkaline and acid. * The JP107 is durable and can run for several years. * The JP107 removes mineral deposits effectively. * Some people have a difficult time making adjustments to the levels. * If you’re used to traditional water ionizers, the touch screen controls will need some time getting used to. However, there are no real serious issues with the Venus, and as the following will show, most reviews are positive. A lot of people have purchased the Venus and most of them are satisfied with the product. One feature that’s been praised a lot is the flow control knob, as it’s usually only available in costly water ionizers. Not only is it available on the Venus, but customers say it is very easy to use and gives them complete control over the water’s alkaline strength. A lot of other reviewers have also remarked how well the other features have been integrated compared with other water ionizers. While some customers have noticed the lack of a reverse cleaning system, it’s no big loss since the Venus has a 10 second auto cleaning feature. The other thing that reviewers have noticed is how durable it is. The Venus has a sleek appearance, but it is built for heavy duty work, and as one reviewer said, the Venus is a “workhorse”. One of the concerns of people have with water ionizers is how it might affect the water’s taste, but none of the reviews indicate any problems here. Some customers have noted that it would have been better if numerical numbers were used rather than bars, but it is a minor issue. There are other aspects of the product that customers enjoyed, chief among them the ease of installation, and there have been no side effects reported. In addition, people have noticed how compact it is and how it doesn’t occupy a lot of room compared to other water ionizers. The popularity of alkaline water has led to the development of several water ionizers, but not all of them are worth considering. In fact some of them are quite terrible and use outdated technologies or do a poor job of removing mineral deposits. Fortunately, that’s not the case with the Venus JP107 as it’s one of those rare products that live up to the hype. The first thing you’ll notice is the generous warranty, an indication of quality, and the amount of pH level control is unheard of in water ionizers in this class. The other nice thing going for the Jupiter machine is the ease with which you can install and use it, a very common problem with other water ionizers. As a replacement for the Microlite line, the Venus JP107 is superior in every aspect. Special mention should be made of the Venus cell electrodes as they keep mineral deposits at bay. Taking everything into consideration, the Venus JP107 is an outstanding water ionizer. The company made a lot of lofty claims for this machine, but you can’t blame them as the machine is really great. The features speak for themselves, and the positive reviews that it’s been getting show just what kind of water ionizer the Venus JP107 really is. This entry was posted in Water Ionizer Reviews, Water Ionizers on June 22, 2014 by admin.